"Ain't That Loving You Baby" / "Ask Me"
(1964) "Do the Clam" / "You'll Be Gone"
(1964) "Do You Wanna Dance?" "Blue Christmas" is a Christmas song written by Billy Hayes and Jay W. Johnson and most famously performed by Elvis Presley. It is a tale of unrequited love during the holidays and is a longstanding staple of Christmas music, especially in the country genre. The song was first recorded by Doye O'Dell in 1948, and was popularized the following year in three separate recordings: one by country artist Ernest Tubb, one by musical conductor and arranger Hugo Winterhalter and his orchestra and chorus, and one by bandleader Russ Morgan and his orchestra (the latter featuring lead vocals by Morgan and backing vocals by singers credited as the Morganaires). Tubb's version spent the first week of January 1950 at No. 1 on Billboard magazine's Most-Played Juke Box (Country & Western) Records chart, while Winterhalter's version peaked at No. 9 on Billboard's Records Most Played by Disk Jockeys chart and Morgan's version reached No. 11 on Billboard's Best-Selling Pop Singles chart. Both Morgan's and Winterhalter's versions featured a shorter pop edit of the original lyrics. Also in 1950 crooner Billy Eckstine recorded his rendition, backed by the orchestra of Russ Case, with these shortened lyrics in a variation close to what is now the common standard for this song; the orchestral backing of this recording has often been wrongly accredited to Winterhalter. Elvis Presley cemented the status of "Blue Christmas" as a rock-and-roll holiday classic by recording it for his 1957 LP Elvis' Christmas Album. Presley's version is notable musicologically as well as culturally in that the vocal group the Jordanaires (especially in the soprano line, sung by Millie Kirkham) replace many major and just minor thirds with neutral and septimal minor thirds, respectively. In addition to contributing to the overall tone of the song, the resulting "blue notes" constitute a musical play on words that provides an "inside joke" or "quail egg" to trained ears. 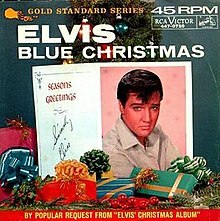 "Blue Christmas" was also included on a 1957 45 EP (Extended Play) entitled Elvis Sings Christmas Songs (EPA-4108), which also included "Santa Bring My Baby Back (To Me)" on side one, with "Santa Claus Is Back in Town" and "I'll Be Home for Christmas" on side two. Presley's original 1957 version was released as a commercially available single for the first time in 1964. This single was also a hit in the United Kingdom, reaching No. 11 on the British singles chart during the week of 26 December 1964.. In late December of 2018, the BPI certified the single with a Silver Award, reflecting sales in the UK in excess of 200,000 copies since its release in 2004. And, on Billboard Magazine's January 5, 2019, edition the song reached the #40 position inside the Billboard Hot 100, the latter for the first time since its release in 1964. (a) the B-side of "The Man with All the Toys" single. (b) a track on The Beach Boys' Christmas Album. The Beach Boys' version reached No. 3 on the US Christmas charts, but did not chart in the UK. Following the success of Presley's version, the song has been recorded by a host of rock and country artists, as well as some working in other genres. The following are charting recordings. 1960: The Browns' version peaked at No. 97 on the Billboard Hot 100 singles chart in December 1960. ^ Greene, Andy (30 November 2011). "Readers' Poll: The Best Christmas Songs of All Time". Rolling Stone. Jann S. Wenner. Retrieved 8 December 2011. ^ "russmorganorchestra Resources and Information". Russmorganorchestra.com. Archived from the original on 2012-02-16. Retrieved 2016-09-27. ^ Whitburn, Joel (2004). Christmas in the Charts (1920-2004). Wisconsin: Record Research Inc. p. 50,62. ISBN 0-89820-161-6. ^ "Elvis SongPedia". Elvissongpedia.greggers.net. Retrieved 2016-09-27. ^ "Song artist 2 - Elvis Presley.tsort". ^ Whitburn, Joel (2004). Christmas in the Charts (1920-2004). Wisconsin: Record Research Inc. p. 25. ISBN 0-89820-161-6. ^ "Official Singles Chart Top 100". Official Charts Company. Retrieved 2019-01-01. "Child of Winter (Christmas Song)"
"Where Do I Fit in the Picture"
"Dreaming with My Eyes Open"
"If I Could Make a Living"
"This Woman and This Man"
"My Heart Will Never Know"
"Only on Days That End in "Y""
"One, Two, I Love You"
"You're Beginning to Get to Me"
"Once in a Lifetime Love"
"If You Ever Feel Like Lovin' Me Again"
"Jesus Was a Country Boy"
"She Likes It in the Morning"
"She Won't Be Lonely Long"
"Where Do I Go from You"
"Like We Never Said Goodbye"
This page was last edited on 26 February 2019, at 16:32 (UTC).